Most important is the publishing date and the location. This story has several locations, but only one eventful date. Well, technically two dates exactly a hundred years apart. 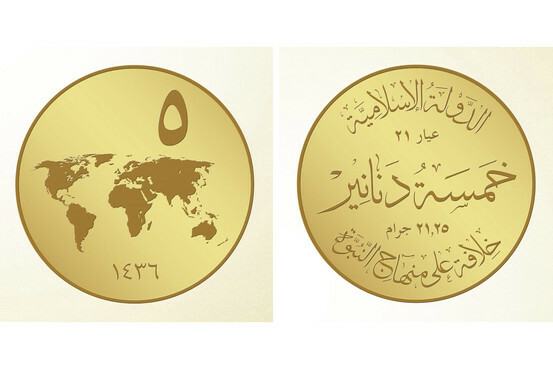 Dateline Iraq: Islamic State leader, “Caliph” Abu Bakr al-Baghdadi announces plans for IS (Islamic State) to begin minting its own official Dinari coinage in various denominations for use across the newly established, and Sharia governed “Caliphate”. This announcement came within 24 hours of a speech released by al-Baghdadi, wherein he vowed to press on in establishing the Caliphate and fight “to the last man” in order to fulfill Allah’s directive, calling on Muslims everywhere to join the Jihad. This following rumors that he had been wounded in a coalition force bombing. According to this USA Today story, the coins carry the words in Arabic: “The Islamic State / A Caliphate Based on the Doctrine of the Prophet.” Nothing Islamic about that, Mr. Obama. No, this was not the first time that a Muslim opened Congress in prayer, but it was the first time the name of Allah was invoked, and the first time Quran was quoted in that prayer. I wonder, when was the last time even a Christian prayer was allowed to invoke the name of Jesus Christ in the US Congress? Dateline Nigeria: Boko Haram, the Islamic Terrorist organization who kidnapped 276 schoolgirls from a single town, has now seized control of that town of Chibok, as well as Hong and Gombi as it continues its Jihad to establish Nigeria as an Islamic State. presence of President Theodore Roosevelt (bearing the scripture “The Word was made flesh and dwelt among us” (John 1:14) and the final “finial” placed in 1990 in the presence of President George H W Bush. 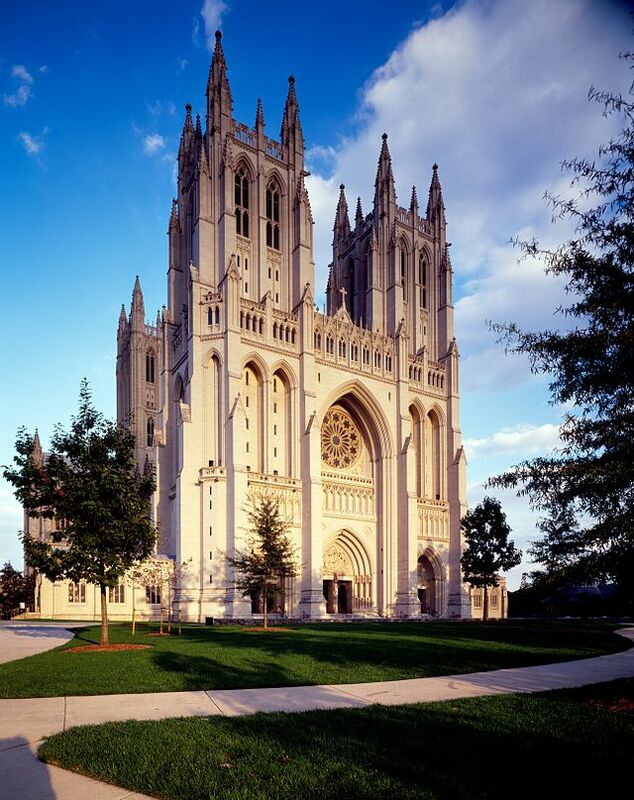 The National Cathedral quickly became the center of services of prayer, thanksgiving, memorials and funerals of Presidents and other state dignitaries, as well as national prayer services such as the 9/11/2001 terrorist attacks on the US. It has been designated by the United States Congress as a National House of Prayer. Friday, November 14, 2014 the National House of Prayer became a mosque. The administrators rearranged furnishings and laid prayer rugs for the 200 Muslim attendees in a fashion where they faced Mecca and did not have to view any Christian icons or symbols while praying to Allah. How nice. I am continuing to wait with bated breath the day when a Christian Pastor is invited into a Mosque to preach the Gospel and pray in the name of Jesus Christ! The service was officiated by South Africa’s ambassador to the US, and Muslim scholar, Ibrahim Rasool. Dates are not coincidental when it comes to Islam. Symbolism of events and dates in history are very important and are used often to make a statement. Take for instance, this date, 11/14/14. Dateline Constantinople, Ottoman Empire, November 14, 1914: The Caliph, Sheikh Ul Islam declares Jihad and urges Muslims to take up arms against the European Allies in World War One in its own alliance with Germany. When the Caliph Mehmet II entered Constantinople in conquest in 1453, after 3 days of butchery, pillage and destruction, he rode to the Hagia Sophia, the greatest church of Eastern Orthodox Christianity, and halted its defacement. He immediately called for dedicatory prayers and as the Adhan was echoing off the interior walls of the church, it was transformed into a Mosque, as a sign of conquest. This has historically been the pattern, especially concerning any church of importance or grandeur, to take possession of and declare it a waqf (Islamic possession), which is forthwith and forever Islamic property. The Grand Mosque of Mecca (The Kaabah), the Temple Mount in Jerusalem, and the Great Cordoba Mosque are all historical examples of this. In that Fatwa, or declaration of Jihad, the Turkish Caliph Mehmet Ul Islam, outlined the Quranic rules for jihad which were instructions to “take no friends of the Jews or Christians” and “kill them wherever you find them”, driving the infidels from the Land. In 1914, Turkey was home to about 2 million Armenian Christians, 1.8 million Greeks, and 750K Assyrian (or Syriac Christians). By 1923, a million Greeks, 300K Syriac’s, and 1.5 million Armenian Christians had been slaughtered by Turkish and Ottoman Kurdish forces. Most of the survivors had been displaced, running for their lives, or in deportation pogroms. Yet, even today Turkey’s government refuses to recognize the holocaust perpetrated by its early 20th century governments, initiating the bloodiest century in world history. The Turkish government has banned books discussing the matter and continues its denial, with PM Recip Tayyip Erdogen calling for “an impartial study by historians” as to the fate of the Armenian People during WW1. Maybe we could loan him a few of our “historians” who have revised our own American History for today’s consumption. While the Pogroms, the “death marches” and the extermination orders began to be fulfilled in 1915, November 14, 1914 was the date of issuance of this official Fatwa which gave not only official authority, but moral prejudicial purpose according to the tenets of Islam, as directed in the Quran and Hadith composing the legal basis of Islamic Jurisprudence (Sharia). It was modeled after the last words of the Prophet Muhammad himself, “O Lord, perish the Jews and the Christians. They made churches of the graves of their Prophets. Beware, there should be no two faiths in Arabia. (Hadith – Muwatta Imam Malik, p. 371) Stands to reason that the Turkish Caliph would emulate that Prophet above all Prophets, and seek to eliminate all faiths in Turkey, except Islam. As far as genocides go, the Armenians don’t get much press. We all have heard of the Jewish Holocaust. We’ve heard of the short-lived Rwanda genocide where 800,000 were killed in just a couple of months in 1994. We know of the “Killing Fields” of Cambodia in the late ’70’s when Pol Pot’s Khmer Rouge wiped out over 2 million ethnic minorities and anyone who was a threat to the Communist ideology. Maybe you’ve even heard of the Ukrainian genocide when Stalin starved or executed 7 million, mostly farmers who refused to “Collectivize” after the Communist Revolution formed the USSR, although he was responsible for several genocides that never made Western attention. But the Armenian genocide continues to resonate for the United States and other Western nations who are increasingly faced with Islamic infiltration and confrontation. It is amazing how the Turkish Delegation continues to work effectively in statehouses around the United States, with little or no resistance. Turkey’s “cold war” on Armenia continues, even though Armenia has been relegated to a small sliver of mostly mountainous country less than 12,000 sq miles sandwiched between Turkey, Iran, and Azerbaijan, with Georgia on the north in a region which was part of the old Soviet Union, and had been unstable for several years following USSR’s dissolution. Modern Armenia, population 3 million, has good foreign relations with pretty much everyone other than its Turkic neighbors (Turkey and Azerbaijan) who have blockaded the Armenians for 20 years following a hot war, and has a security relationship with Russia for protection against its two hostile neighbors. Meanwhile, the Turks are busy conducting public relations programs across the United States, working to win the “hearts and minds” of American civil servants at all levels, from local city councils and police and fire departments, to state Legislators, Sheriffs offices, and local FBI offices. They extend an invitation to an awards dinner, then present the targeted individual or group with some award concerning community relations. They normally operate through a local Turkish organization such as Raindrop Turkish House or other TCAE (Turqoise Council of American Eurasians) affiliates. Most, if not all these organizations are associated with Fethullah Gulen, the Turkish Imam who lives in Pennsylvania. They have a growing number of Turkish Charter Schools around the USA, and continue to expand that movement, lobbying state legislators. Every legislative session these groups will host a “Legislative Reception” where elected officials are enticed with Turkish food, culture and entertainment. They are then encouraged to join the hosts for a “trip of a lifetime” to their home country of Turkey, usually about 10 days, expenses paid of course. These Turkish emissaries then continue to bring resolution after resolution into legislatures of many states which either praise Azerbaijan or condemn Armenia, or seek to expand current relations with the Turkish government itself. Check your state legislature and most likely you’ll find them there. The Kansas Legislature has dealt with a couple of these resolutions. The first was a blatant attempt to deceive lawmakers into passing a “Turkish-Kansas Friendship Resolution” which was fraught with false claims of Turkey’s great human rights policies. That was an embarrassment to our Turkish “friends” in attendance, being refused before it even came to a vote, so the next attempt was to get a Representative to carry a pro-Azerbaijan resolution the next year. Off floor debate and discussion became quite controversial once again, and one Kansas Democrat Representative who had just recently returned from one of those junkets to Azerbaijan and sponsored the resolution was overheard saying of the Armenians, “Those people don’t matter and their land is just desert”! The Turks and the Azerbaijani’s had done their job well, but the resolution failed to accomplish the desired outcome, prompting two of the same sponsors to bring a pro-Armenian Resolution immediately. The Armenians are a tough, resilient people. For centuries they have been the subject of pogroms, genocide, persecution and wars. They are a Christian culture on the border between atheism and Islam. They are an ancient people with a proud heritage and an uncertain future in a part of the world where nothing is taken for granted. Today they face the additional threat of the Islamic State, or the latest Caliphate, who has already targeted Armenians in Iraq and Syria. American politics notwithstanding, the Armenian people will likely remain when the American people are scattered. I have attached a short video of one Armenian-American family’s story. Please take a look and reflect. The world is not what it seems. Coincidence, or political statement? George W. Bush was the first President to invite an Imam to pray in the National Cathedral, three days after 9/11. I think Obama is not the first Muslim president.